Chris Ferguson has dedicated 18 years of his life to the academic sector at UCLA. That includes his years as an undergraduate student and over a decade worth of his time pursuing a Ph.D. in artificial intelligence. Both of Chris' parents are professors at UCLA with doctorate degrees in mathematics. His father taught game theory and statistics and would often study certain games or create new ones at home. He encouraged a young Chris to participate in these games and at an early age, Chris developed a strong background in gamesmanship. Chris Ferguson began playing poker with his childhood friends. During his college years, he would often compete for play money on IRC and take road trips to Las Vegas. After he won a big blackjack tournament, he moved up to higher limits in poker. In 1994, he decided to concentrate solely on the tournament circuit in Southern California, utilizing his strong background in game theory. 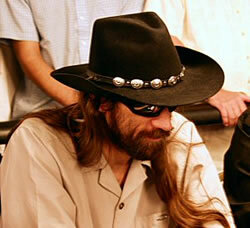 Chris Ferguson played in his first World Series of Poker main event in 1996 after winning a seat in a satellite. He's played every year since then. Chris won his first WSoP bracelet in 2000 after he won the Seven-card Stud event. Later on in that same month, he would take home the title in the Main Event and become the 2000 World Series of Poker Champion. Chris has won 5 WSoP bracelets in his career for No Limit (2000), Omaha Hi/Lo (2001 and 2003), Seven-card Stud (2000), and Half Limit Hold'em and Half Seven-card Stud (2003). His win at the 2000 WSoP is chronicled in James McManus' book Positively Fifth Street. Chris was heads up with T.J. Cloutier when he was dealt A-9. T.J. held A-Q and was leading all the way until Jesus caught a 9 on the river to win the pot and the world championship. Chris Ferguson is one of the best all-around players on the tournament circuit today. In 2004, he had the most cashes for any player in a single year at the WSoP which proved his ability to play well in almost every game. With 36 career money finishes and 20 final tables at various WSoP events, Chris has won over $2.8 million in prize money as of 2004. Chris Ferguson has the uncanny ability to throw a playing card so fast that it can generate enough force to slice carrots, bananas, and pickles from thirty or forty feet away. One of Chris Ferguson's other hobbies is swing dancing. He used to be president of a swing dancing club at UCLA. He also is analyzes stocks and day trades on the side. He frequently guest lectures at UCLA for discussions on game theory. You can also play against him at his online poker site Full Tilt. He even has his very own table. Chris put together a team of designers who created an online site that offers excellent software and great deals for regular players. And the best part of his site is that some of your favorite professional poker players like Howard Lederer and Phil Ivey play there a minimum of ten hours a week.